Born in Bury St. Edmunds, England, Sybil Andrews produced drawings, watercolours, monoprints and oil paintings, but it is her linocuts for which she is most famous, achieving international acclaim for them. During World War I she worked making airplane parts in Coventry, and after the war she returned to Bury St. Edmunds, where she met architect Cyril Power. In 1922, at the age of 24, Andrews left Bury St. Edmunds with Power (who was almost 50) to study art at the Heatherley School of Fine Art in London. Three years later Power and Andrews were appointed by Ian Macnab to staff his newly established Grosvenor School of Modern Art, with Andrews becoming the school secretary. In 1926 while at the Grosvenor School, Andrews and Power met Claude Flight, who taught them how to cut and print from linoleum blocks (a new art form at the time). From 1930 to July 1938 Andrews and Power shared a small studio at 2 Brook Green in Hammersmith, and developed a common aesthetic in their work. This informal working partnership produced an extraordinary body of work – some of the finest prints of the 1930s. Andrews’s themes were of the dynamism of the modern machine age and the movement of the human figure at work or sport, usually executed using only four linoleum blocks. 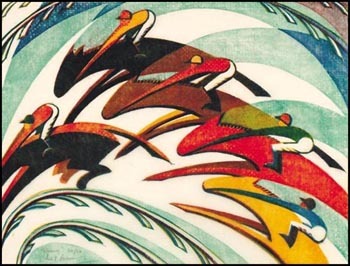 Andrews’s linocuts are acclaimed to have surpassed those of her teacher Flight, and in fact many consider Andrews to be the most gifted of the Grosvenor School artists. 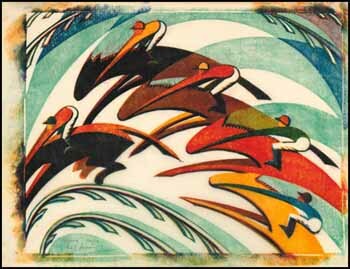 Racing is one of Andrews’s most sought-after linocuts. Its importance is reflected in the fact that this work was chosen for the front cover of Peter White’s catalogue raisonné of her linocuts (Sybil Andrews, Glenbow Museum, 1982). Racing was created when Andrews was still in London and working in the Brook Green studio. It was not until 1947 that she immigrated to Canada, settling in Campbell River on Vancouver Island. Sport was a subject that fascinated Andrews and the Grosvenor School, as it provided them the opportunity to convey speed, fluidity and the expression of physical exertion. The movement and sheer exhilaration of sport was an ideal subject for Andrews to convey her modernist aesthetic. This linocut is the embodiment of the dynamism of horse racing and speed that fascinated the modern world. A copy of Racing is in the collection of the Museum of Modern Art, New York, and was part of the important exhibition at the Museum of Fine Arts, Boston, entitled Rhythms of Modern Life: British Prints 1914 - 1939 that toured to the Metropolitan Museum, New York. This print is a very fine impression with strong bold colours on buff oriental laid tissue.